Cost to stain a deck varies greatly by region (and even by zip code). Get free estimates from deck, patio and porch contractors in your city. Cost to stain a deck varies greatly by region (and even by zip code). Although most decks are constructed of pressure treated or synthetic lumbers that are somewhat impervious to the effects of weather, it is still necessary to consider treating the lumber to add a longer life span to the structure. 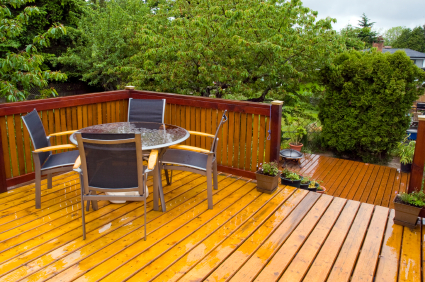 This is usually done through the application of a sealant or a stain, and if the decking is not new it will also require some scrubbing or washing as well. For the purpose of this discussion we will review the costs and materials required to stain (and clean) a deck measuring roughly 20'x25' (or 500 square feet) on a DIY basis. According to AskTheHandyman.net the average professional is going to require between three and five hours to tackle the work, with costs averaging at roughly $2 per square foot. This will include power washing, labor and all materials - including the treatment of any railings or spindles surrounding the deck. Clearly, it isn't necessary to hire someone to do this job, unless free time is at an absolute minimum. Supplies - generally anyone about to tackle a deck staining job will require at least one stiff brush with a long handle (though it must not have metal bristles), a pump 2 action sprayer with which to apply any cleaners, a paint roller with a long handle to speed up the sealant application process, paintbrushes, tarps, and masking tape to prevent stain from reaching areas such as siding and stonework. Hiring the Professionals - if you don't have the time or the inclination to tackle a deck staining project independently you can always hire professionals to do the work. They usually charge on an hourly basis and standard rates for a deck in the size indicated should run no higher than $400 in labor and materials. Should sanding 3 and stripping become necessary, costs will increase substantially. How much does it cost to stain a deck in my city? Cost to stain a deck varies greatly by region (and even by zip code). To get free estimates from local contractors, please indicate yours. Cost Considerations: Redwood is one of the most expensive types of lumber. Depending on the type and grade, it generally runs $5 to $35 per sq. ft. 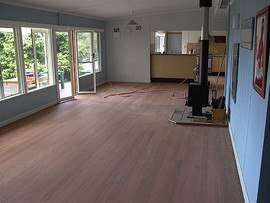 It is also possible to stain your deck using a color that looks like redwood. On average, a good stain runs $25 to $30 per gallon. Process of removing the top surface of a material, such as wood, using sandpaper and/or a specialized sanding machine (for large surface areas). Cost Considerations: Sanding costs run approximately $1.80 per square foot.